Tokyo is a city of immense proportions. It begs to be visited, and to be written about, and these essays do just that. “Tokyo seems to push one deeper into oneself and to strip away the pretensions of the self” (p. 5). “Tokyo displays a rich, heavy tapestry of character types, lifestyles and life stories” (p.137). 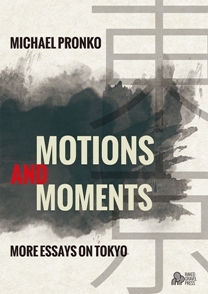 Motions and Moments is the third book by Michael Pronko on the fluid feel and vibrant confusions of Tokyo life, taken from his monthly column that ran in Newsweek Japan for ten years. These personal, narrative essays ponder what the city means, and how it could possibly keep going so intensely, tightly and efficiently. These essays on how Tokyoites work, dress, commute, eat and sleep are steeped in insights into the city’s odd structures, intricate pleasures and engaging undertow. Included are essays on living to size and loving the crowd, on Tokyo’s dizzying uncertainties and daily satisfactions, and on the 2011 earthquake, on how everything and everyone can get wedged in, and why the speed has to be slowed down from time to time. This collection captures the ceaseless flow and passing flashes of life in the biggest city in the world.